Interim Executive Director Announcement: Congratulations, Joanne Roukens! We share our warmest congratulations and thanks to outgoing Executive Director Cheryl O’Connor on her retirement at the end of September. We will miss her strong leadership, clear vision, as well as her deep concern for her colleagues’ well-being and their professional development. 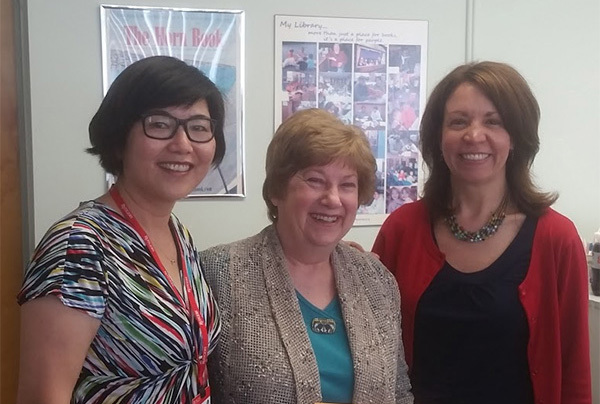 All the members of the New Jersey Library Network have directly benefited from her long, steadfast devotion to the importance of multitype library cooperation. Her hard work, dedication and can-do spirit are a true example of the best in our profession. We all wish her the best of luck, health and happiness in this new phase of life. In accordance with Cheryl’s wishes for minimal fanfare on this milestone, there won’t be a formal retirement dinner, but colleagues throughout the state have been acknowledging and celebrating her 46 years of service to libraries of all kinds. Most recently, HSLANJ presented Cheryl with a resolution to thank her for her work with them over the years. She also was the recipient of the 2015 ASCLA Leadership & Professional Development Award. The LibraryLinkNJ Executive Board is pleased to announce that Assistant Director Joanne Roukens has accepted an appointment to the position of Interim Director. With over 30 years of experience in libraries and library cooperatives, including working as the Executive Director of the former Highlands Regional Library Cooperative, Joanne is ideally positioned to lead the Cooperative during this transitional period. Her appointment begins October 15th. The Executive Director Search Task Force, working with search firm Bradbury Associates / Gossage Sager Associates, is in the process of developing a pool of strong candidates to be Cheryl O’Connor’s successor. Please read and share the job posting widely -- and soon! The position closes on October 18, with interviews to be held in November. Delivery for LibraryLinkNJ school members resumed on Monday, September 14. Back-to-School is a great time for all members to refamiliarize themselves with how our Delivery Service works. Our thanks to the 131 libraries that participated in the Summer 2015 Delivery Survey. We value your feedback as we continue to work with Dynamex to improve this critical service. Owing to Cheryl’s retirement this fall, and in anticipation of her replacement joining the cooperative in January, State Librarian Mary Chute has approved the cancellation of our usual Fall Membership Meeting. We look forward to seeing you all at our Spring Membership Meeting! We’ll send out a save the date announcement in the coming months. LibraryLinkNJ has a brand-new discount on Beanstack, an early literacy web service that engages families with young readers and facilitates your library's summer reading program. It starts with sending parents a weekly recommendation of a book and event at your local library, matched to each child's interests. Parents are also provided tools for building literacy. Read about Sacramento Public Library’s Beanstack launch in School Library Journal. Used on a computer, smartphone, or tablet, Beanstack appeals to library users and non-users alike. 43% of Beanstack users are not initially cardholders, though Beanstack incentivizes library visits and membership throughout the web app. Beanstack includes a summer reading module for all ages, featuring administrative tools that make it easy for your staff to track stats for each branch, redeem incentives, run raffles, and help patrons log their reading. Montgomery County Library (MD) switched to Beanstack for its summer reading program this year and saw a 27% increase in participation. LibraryLinkNJ public library members receive 25% off list pricing. Libraries who commit to use Beanstack to manage their next summer reading program receive an additional 10% off. Find full details on the discount page and sign up for a free webinar. This offer is valid through December 31, 2015. Many NJ public libraries have taken advantage of the LibraryLinkNJ discount on the Pronunciator language learning service. If you have patrons who are preparing to become U.S. citizens, Pronunciator's new course, ProCitizen, can help. With 100 instructional videos (all closed-captioned), plus drills and quizzes, ProCitizen guides the learner through all the civics and vocabulary they'll need to know for the Naturalization Test. ProCitizen is an included module in the Pronunciator language-learning database, but can also be launched directly from a web page. If you already subscribe to Pronunciator, you can start using ProCitizen now. Learn how to access ProCitizen, link to it from your website and find graphics here. Check out the Pronunciator discount page for complete discount details. We have a host of wonderful learning opportunities for you to participate in this fall. Join us! We’ve added more choices and removed some barriers to participation. We present a more comprehensive and flexible program for all of our member libraries! Additionally, we have incorporated the On-Site program for school libraries into the main On-Site program. Members are no longer limited to a specific menu of on-site training options. You may either choose a workshop from our suggested list or work with another trainer or consultant. LibraryLinkNJ will offer a subsidy of up to $750 for each approved workshop request. Libraries may request one subsidy a year. Our fiscal year runs July to June. Libraries are no longer limited to our menu of program choices. Libraries will book programs directly with a vendor/consultant and will be responsible for paying them. There is no minimum number of staff required to hold a program. We will provide a subsidy of up to $750 for each approved request, not to exceed the actual combined cost of the trainer’s fee and travel costs. Example: if the total cost of the program is $550, the subsidy will be $550. Funds for this program are limited, so request early. Check the On-Site section of our website for all of the program details, and contact Joanne Roukens to discuss your library’s specific needs. This event has it all! Enjoy and learn from a unique networking experience, including a brief keynote, a panel discussion, a trivia contest, free professional headshots, great prizes & more! Panel Discussion: What Do Libraries Look for in Their Next Hire? Registration is open through Monday, September 28. Audience: All library staff involved in library online communications (not just social media!) & anyone working with special collections in public, academic & special libraries. Libraries of all sizes and kinds have special collections. Leverage them on social media to get your content noticed by a wide audience of scholars, laypeople and colleagues, and to create a sense of place locally. This webinar will discuss models for dividing up the work and finding collaborators no matter the size of your staff, tips for selecting material, taking great photos, and finding the right platform for your content. Presenter Colleen Theisen, curator of the University of Iowa’s popular Special Collections Tumblr, will also highlight successful examples from institutions large and small. ​Registration is free & limited - secure your space today! Presented by: Mary Beth Weber, head of Central Technical Services at Rutgers University Libraries in New Brunswick. Program Description: Mentoring can be critical to the success of any career. A good and effective mentor can help others to meet career goals, as well as motivate and set a good example. This webinar will discuss the importance of mentoring others and ways that you can serve as an effective mentor. Continue the relationship after your mentee has reached his/her desired outcome. Registration is limited - secure your spot today! Audience: All library staff interested in implementing their library site in Drupal. No Drupal experience or programming skills required. This four-part webinar series is an in-depth course on how to manage content and administer the Sample Drupal Library Website that LibraryLinkNJ created for our member libraries. LibraryLinkNJ member libraries are eligible to download this sample site at no cost, and can modify/customize the sample site for their own library at their own pace. LibraryLinkNJ has made some improvements on the sample site. Please find more information about our Drupal Sample Website for Libraries. The series will consist of 4 live online sessions: Three days of 3-hour training sessions, each with two hours of training and a final hours for Q&A, and a follow-up 90-minute session for any questions that might come up after the first three sessions and you start working on your site. Registration is open & limited to 20 participants: secure your space today!